“I have learned that presence is really important. That if all I have to give is my presence it is enough. Also that if I am upset by something else that people can pick it up and take it on. That was a hard one to learn. Early on we were frustrated with the room we had gotten, the difficulty in getting in and the inmates picked it up and took it that we were frustrated with them. So, I learned how important it is to be present and aware of what I might be sending out. I learned so much about how to be flexible with the lesson plan, how to go with what is up for people and how to really listen with my heart. I learned that even if I don’t “teach” anything, any understanding, connection, and empathy I can give is a gift. I learned how much of an impact these women have on me, how I carry their faces in my mind and send them loving kindness and good will. I really value being able to contribute and share NVC in a way that I enjoy and a way I think is meaningful. I value all the support from the small amount of staff! I value being valued by FP volunteers, staff, and the inmates and administration of the DOC and staff of the prison. I strongly value the mission of FP and the effects it has for people. 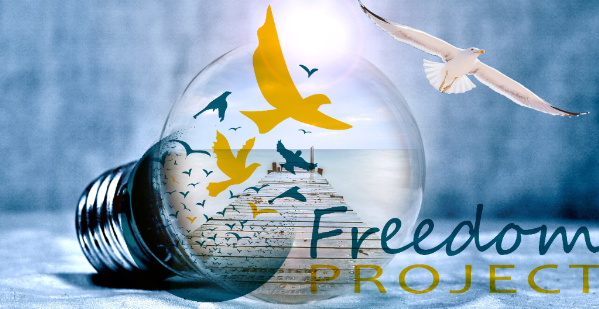 What’s unique about your volunteer experience at Freedom Project? I think it’s quite unique to interact with inmates and have so much fun and connection. How have your volunteer contributions of time and energy affected your own life? And the lives of others? It has contributed a lot to my own life – given me meaning and purpose, given me hope and connection. I think it gives me invaluable perspective which leads to immense gratitude for the human spirit and for my own blessings. I appreciate freedom so much more and I think FP is contributing to more peace in the world. I think it greatly affects the lives of others who are touched by the work. I think it has contributed to many people in the prisons and given hope and care. I think it is helpful for my children to learn from my experiences and see the humanness in everyone. Why do you volunteer inside prison for Freedom Project? Because I meet my needs for contribution and meaning. I want to help and support plus I learn so much from their courage. I also love to share NVC and I love to see their “ah ha” moments when they get a meaningful piece of learning. It gives me hope and trust that we can spread peace and heal. Would you share with us a story or an “ah ha” moment that helped you realize the importance of this work? She had seen and taken responsibility for her actions. She saw what needs she was trying to meet and how it wasn’t meeting her needs! I later saw her in segregation and she said she felt so ashamed because she wanted to be seen for how hard she was trying. And how much she needed skills. That woman needs our help, and she wants to learn how to be able to handle tough situations without reacting out of habit. And it’s hard, just like it is for me. That’s when I knew the importance of this work. I can imagine the impact her learning will have on her and her family.